Donation kiosk now on site at Portsmouth Kroger. A modern solution to a common holiday problem is now being utilized in Portsmouth by the Salvation Army. 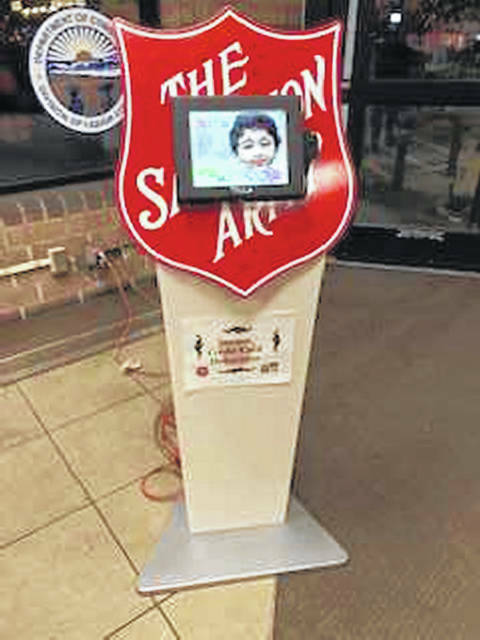 With pocket change becoming nearly obsolete, and many people choosing to carry cards over cash, the Salvation Army has set up an official credit card kiosk at the Kroger location in Portsmouth to make donating that much easier. “We’ve had many folks over the years comment that they wish we had a credit card machine so they could make their donations that way,” said Captain Dan Simco. Simco stated that while the kiosk has been on site for the past two weeks, it has received light usage, but he feels that once people are aware of its convenience more people will choose to utilize the kiosk. The Kiosk is on site Monday through Saturday from approximately 10:30 a.m.-7:30 p.m. According to Simco the mobile unit is unmissable, a white and red kiosk adorned with the Salvation Army logo. In addition to the kettle drive, the Salvation Army’s Angel Tree program is going on until Dec. 15th. According to Simco, this year the number of toy donations is down and the Salvation Army asks for the community’s help in purchasing and making a toy donation at one of their drop off locations. Angel Trees are located at Walmart, Kroger, and Rural King with tags hanging on the branches which each represent a child and their wish list. Those wanting to help a child in need can select a tag from the tree and shop for them. “They can purchase those gifts there and leave them at that store, or they can drop them off at the Salvation Army,” said Simco. Toys will be collected the weekend of Dec. 15 and will be distributed Dec 19 and 20.